The height of a four-story building, the Wärtsilä RT-flex96C is a two-stroke turbocharged low-speed diesel engine designed by the Finnish manufacturer Wärtsilä. It is designed for large container ships that run on heavy fuel oil. Its largest 14-cylinder version is 13.5 metres (44 ft) high, 26.59 m (87 ft) long, weighs over 2,300 tonnes, and produces 80,080 kilowatts (107,390 hp). The engine is the largest reciprocating engine in the world. The 14-cylinder version was put into service in September 2006 aboard the Emma Mærsk. The design is like the older RTA96C engine, with common rail technology instead of traditional camshaft, chain gear, fuel pumps and hydraulic actuators. All this provides the maximum performance at low revolutions per minute (rpm), lower fuel consumption and lower harmful emissions. The engine has crosshead bearings so that the always-vertical piston rod allows a tight seal under the piston. Consequently, the lubrication of the engine is split: the cylinders and the crankcase use different lubricants, each being specialised for and dedicated to its role. The cylinders are lubricated by continual, timed injection of consumable lubricant, formulated to protect the cylinders from wear and to neutralise the acids formed during combustion of the high-sulfur fuels commonly used. The crosshead design reduces sideways forces on the piston, keeping diametral cylinder liner wear in the order of only about 0.03 mm per 1000 hours. The descending piston is used to compress incoming combustion air for the adjacent cylinders which also serves to cushion the piston as it approaches bottom dead centre(BDC) to remove some load from the bearings. The engine is uniflow-scavenged by way of exhaust valves that are operated by electronically controlled, common-rail hydraulics, thus eliminating the camshaft. As of 2006, more than 300 RT-flex96C engines and older RTA96C engines were in service or on order. The latest progress in marine technology was featured onboard Titanic. She was fitted with a Parson’s low pressure turbine engine as well as tipple expansion reciprocating steam engines. 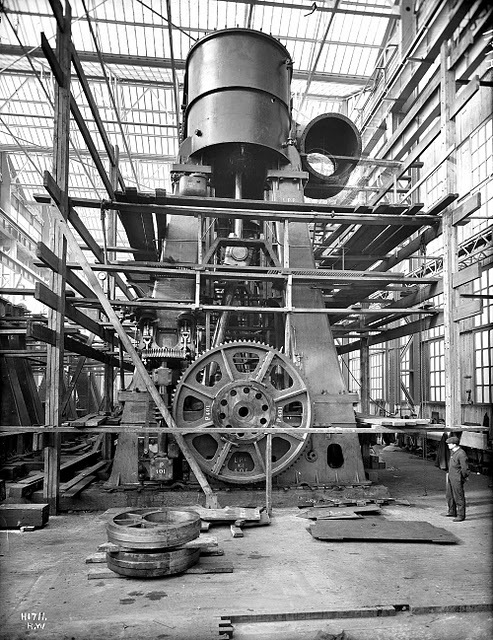 The reciprocating engines ran at 75 rpm and generated 30,000 horse power. The thought was more power achievement without the use or requirement of additional steam. The turbine engine drove Titanic’s center propeller and the reciprocating engines drove her two port and starboard wing propellers. The turbine ran at 165 rpm and generated 16,000 hose power. The wing props were 23′ 6″ in diameter and the turbine prop was 17′ 0″. Her top speed was 23-24 knots. “Each reciprocating engine drove one 3-bladed wing propeller of 23½ feet diameter, one on the port side of the vessel, and the other on the starboard side of the vessel. The turbine engine drove a central propeller of 16.5 feet diameter located on the ship’s centerline directly ahead of the rudder. The reciprocating engines were designed for 15,000 indicated horsepower (IHP) each when running at 75 revolutions per minute. The turbine was designed to develop about 16,000 shaft horsepower (SHP) when running at 165 revolutions per minute. At those numbers of revolutions, the ship was expected to make 21 knots.